Home › Latest News › Islamabad protests: Pakistan’s army says it is ready to help! Islamabad protests: Pakistan’s army says it is ready to help! Pakistan’s army says it is “fully ready” to assist the government in dispersing Islamist protesters blocking a highway in Islamabad. The government asked the military to help restore order after police failed to disperse demonstrations on Saturday. However, the military’s statement appears to criticise the government’s handling of the situation, saying police had not been properly utilised. At least six people are believed to have been killed in the clashes. The army has asked for further clarification before ordering the deployment of troops. The demonstrators have been blocking the Faizabad Interchange for several weeks, demanding the sacking of Law Minister Zahid Hamid, whom they accuse of blasphemy. Their protests have spread to other cities, including Lahore and the southern port of Karachi. On Saturday, the government suspended private news channels and blocked certain social networks – including Facebook, Twitter and Instagram – out of concern that live coverage of the police action could inflame religious sentiments. Local media said they remained blocked on Sunday. 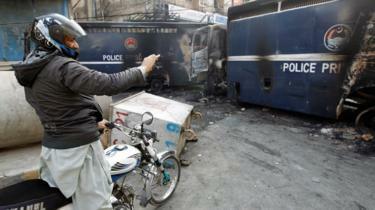 The situation in Islamabad had been simmering for three weeks before it erupted into violence on Saturday. Many blame the government for the delay, which allowed the protesters to grow in numbers and build a countrywide momentum for their movement. And when they moved, the authorities did not appear to have a good plan. The police failed to arrest leaders of the protest, and when trouble started to spill into other cities, they resorted to a controversial move to block all live news channels and social media websites. This has raised many eyebrows. An editorial in Dawn newspaper on Sunday morning said it had “oddly equated the government with the protesters.” Others have raised concerns over the timing of this tweet, saying it would “embolden the protesters”. 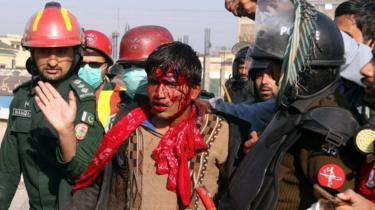 About 8,500 elite police and paramilitary forces took part in the operation to clear the Faizabad Interchange. The operation was later suspended. The request for the military deployment came after hundreds more demonstrators turned up unexpectedly, forcing the police to retreat. The minister has since apologised saying it was a clerical error.